When selecting railings for your next outdoor project, you might be surprised that there are a lot more options than you think. The railing industry has exploded in the last few years. There are many choices in colors, materials, width, and required maintenance. But, overall the trend is very quickly turning toward thin metal railings for their aesthetic appeal and because thin railings allow more visibility beyond your deck. Here’s the “skinny” on railings. A few years ago, the next big thing in railing was vinyl railings. Vinyl is used most exclusively in white. Vinyl is inexpensive but the trade-off is it is not very structurally sound. Vinyl is sensitive to scratching, it fades and it usually has to be reinforced on the inside with wood or metal. The bottom line is it’s inexpensive for a reason. Composite railings are a low-maintenance option but there are also some drawbacks to composite railings. The cost of composite railings can be quite prohibitive. Also, railings made of composite woods are thicker and are square. While the drawbacks of a square rail are not readily apparent, there are more sides to paint on a square rail. There are more sides to clean. You can multiply your efforts in staining, sealing and cleaning by four. For this and other reasons, metal railing has really hit its stride. As for adding metal railings to your project, most consumers no longer want everything to match. Railings today are increasingly seen in contrasting colors instead of matching colors. Customers now want a railing with character and they want a railing they can see through. Metal railings are more slender than wood or vinyl railings ( typically 50% of the thickness or less). Metal railings combine view, strength, rigidity, durability, beauty and low maintenance all in one. The most popular railing color over the last few years is black. 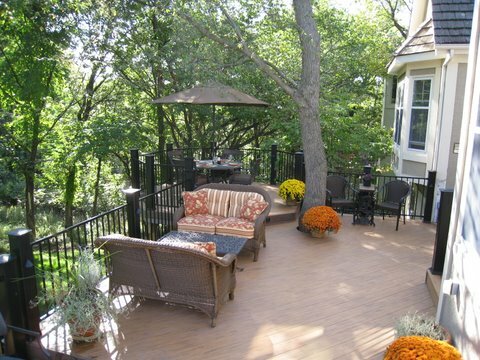 Regardless of the deck color, with it’s upscale look and low maintenance, black metal railing is a tremendously popular choice. The two most common types of metal railings are steel and aluminum. These railings are often powder coated. Fortress steel railing is made of steel and is powder coated. 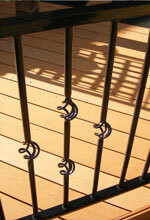 Deckorator also makes metal railings and that’s a product we build with quite a bit. Timbertech also offers a wonderful rail of reinforced composite, it comes in black and white, and it is more scratch resistant, durable and doesn’t need reinforcement to maintain rigidity. Radiance Rail has been a big seller with Archadeck Kansas City in black, with many happy customers. 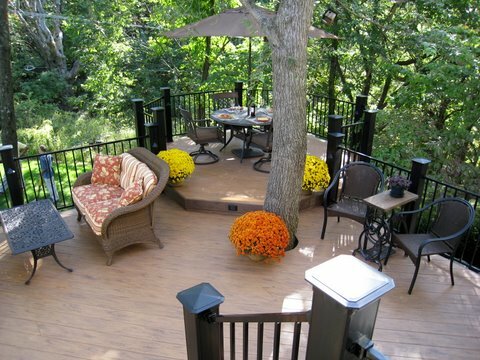 Whether you are considering the ever popular metal railings, or a wonderful composite give Archadeck of Kansas City a call today and we can discuss all the possibilities to custom design and build your next deck or outdoor structure. This entry was posted in Composite woods, Decks, low maintenance decks, Low maintenance railings, TimberTech and tagged Archadeck of Kansas City, Custom decks, Decks, low maintenance decks, TimberTech Radiance Rail on March 29, 2011 by archadeckkansascity. One of the facts of life in the current century in the United states is we have multiple choices for everything we do. We go to the grocery store and are overloaded with 100 types of bread or cereal. The building industry has seen the same type of explosion of choice over the last 15 years. What used to be a relatively simple decision on what kind of material to use to build your deck or porch is now much more complex. Even more complex is the issue of locating a contractor who actually has expertise in a wide variety of materials. A great many contractors regularly build with only one or two materials, and therefore aren’t up to date on the specifications and requirements of more specialized materials. For example when composite decking boards first appeared on the market in the late 1980’s there were only a few brands to choose from, and there was little difference between brands. At the time all of the products used very similar technology and manufacturing processes. Today the situation is entirely different, especially with composite decking and railing. There are over 60 brands on the market, and new ones are being introduced every year. Many companies have developed proprietary manufacturing technologies and systems, with multiple different ingredients. Some companies do a great deal of product development and testing, and some companies do very little. In the last few years several composite companies have gone bankrupt, and other have been acquired and changed products. The end result of this is a very confused marketplace for the potential homeowner and consumer. Today there are substantial differences between brands of composite decking materials. There are multiple price levels (some 2-3 times the price of others), multiple warranty periods, and major track record and history differences between brands. Quite a few brands have experienced lawsuits, consumer complaints, and caused a lot of grief to people who purchased them without sufficient research. There are differences in color fading, stain problems and scratch sensitivity….. in addition some brands are harder to clean than others. 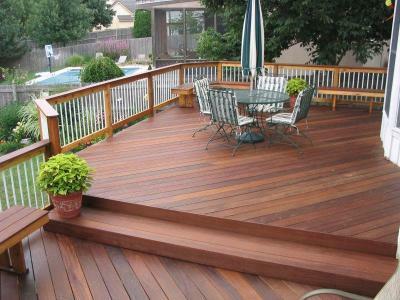 The decking industry, just like any other industry, has its low quality players and its high quality players. 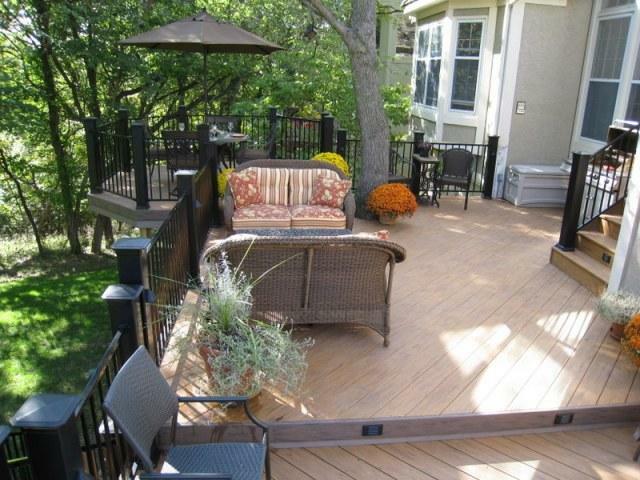 If you are considering a composite deck, do your research and make sure that your contractor has experience and a track record with the material you are interested in. This entry was posted in Decks, low maintenance decks, porches, Screen Porches, Stain resistant decking and tagged composite decking, Custom decks, Decks, porches, Screen Porches on March 19, 2010 by archadeckkansascity. Frequently we field questions from clients about their roof options on a deck, and the decision to leave a deck open or to go for a full screened porch option. 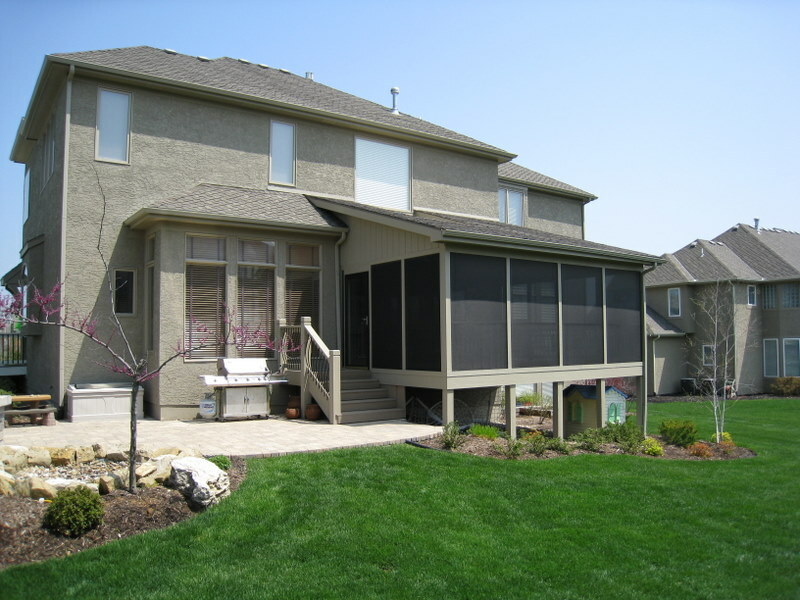 The following are the major reasons our clients build a screen porches. 1. The shade provided by the roof and screens makes the harsh summer sun easier to live with. When you combine a roof, screens, and a ceiling fan summer temperatures are much more controllable. 2. 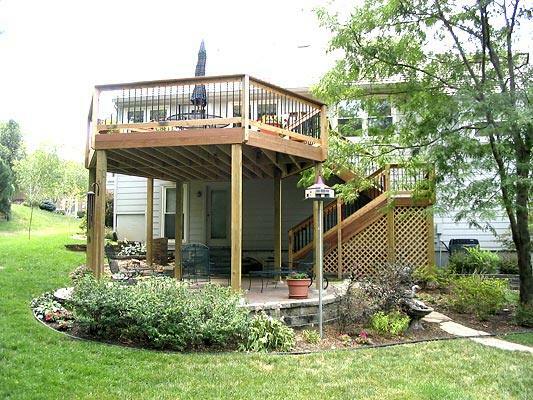 Screen porches are much more private, especially when neighbors views look right at your backyard or deck area. The combination of roof and screens partially blocks the view. Additionally optional heavy-duty screening is available that provides even more privacy from neighbors. 3. I love to sit outside in the summer rain! Multiple people have told us they really enjoy being outside in the rain during the summer. There is a feeling of connection with nature, without being wet. 4. We can dine outdoors without the bugs and flies. Obviously in this part of the country bugs, flies and mosquitoes are common. These annoying pests can really diminish enjoymentof an outdoor dinner, but the screened porch allows you to minimize them. 5. I have a place for my kids to play, but not be in the house and under foot. The porch allows a sheltered play area, protected from the weather. 6. I don’t have to worry about my furniture getting wet. Many people would like to use a better grade of furniture or cushion, with more style, and the porch allows this. 7. It’s a great area for entertainment! Most guests love the outdoors. 8. I can have lights and a TV outside, without worrying about damage. 9. My cat and dog love the porch! Many pets really enjoy sitting outside on a porch. 10. ” It’s the best room in my house!” For all the above reasons and more we have had many clients exclaim this when we were all done. This entry was posted in Decks, Screen Porches and tagged Custom decks, custom screen porches, Decks, Screen Porches, screened rooms on January 26, 2010 by archadeckkansascity. 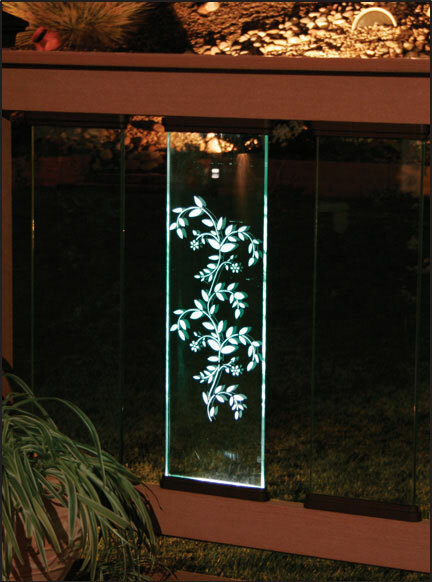 If you want etched glass and illuminated with LED lighting, it’s available! http://www.de-kor.com/Steel, glass, aluminum-you can get it all. One company even has 29 different etching designs available for your glass railing panels. What color would you like? A black baluster draws your eyes to it and makes a bold statement. A bronze baluster tends to deflect your gaze and lets you see past it. Green, white, red, unpolished aluminum, and copper can also be used. Hammered, glossy, antiqued, and oil rubbed are just some of the finishes available. 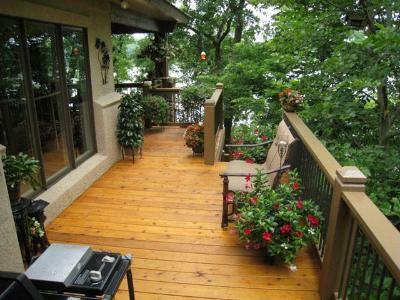 A deck can also be made with a railing that matches the decking for a cohesive look. Most of the composite brands have rails and posts to match the decking. This entry was posted in Decks, Screen Porches, Uncategorized and tagged Custom decks, custom screen porches, Decks on January 25, 2010 by archadeckkansascity.